A high school class has analyzed plasmids by the help of restriction enzymes and electrophoresis. The class got delivered two different plasmids, pBR 322 and pC 508. These two plasmids were going to be clipped by EcoR I and Hind III. Figure 1 shows the two plasmids with specification of the two cutting points for EcoR I and Hind III. Furthermore, the cutting points are also shown for the enzyme Pst I. In figure 2 you can see the result of the restriction analysis. 2) What DNA-pieces would be formed if you had clipped with Pst I ? 1) You can see that the figure is showing the result of the restriction-analyzis. As for the plasmid pBR 322, you see that the result of the cutting of Hind III and EcoR I, is that both enzymes have the same size. Figure one shows that Hind III cuts over 0 bases and EcoR I cuts at 0 bases. In pC508 you see that both enzymes have cut two times. EcoR I have cut at 1200 and 5800 bases, which you can see on figure 1. You can see the result of this in figure 2 (the gel electrophoresis). Hind III cuts at 6400 and 1200 bases, which again is an explanation as why the DNA-molecyles (figure 2) have different size. Are these questions correctly answered? Your estimation of the sizes of the fragments for pC508 are incorrect. Look at the size of the plasmid at the center of the circle.The size of your fragments has to add up to that number. So if you were sure that one fragment was 1000bp, then the other fragment would need to be 6300bp. You should also notice that fragment sizes for EcoR1 and HindIII digests should not be the same size. You also need to say something about the type of DNA you have in the pBR322 lanes. Is it linear, circular, supercoiled? For question 2, your explanation for pBR322 is okay, you should still mention the type of DNA you have in those lanes. You need to explain not only where PSTI cut but also the size of the fragments that it produces. A place where a restriction enzyme cuts is called the restrictions site, so instead of saying cuts in one place, or two places, you should say at a single restriction site, etc. Not the answer you're looking for? Browse other questions tagged molecular-biology homework plasmids restriction-enzymes or ask your own question. What is the advantage of restriction enzymes cutting only at specific sites? RAD sequencing: choosing the appropriate enzyme? Can Bacteria Repair Dephosphorylated Plasmids? 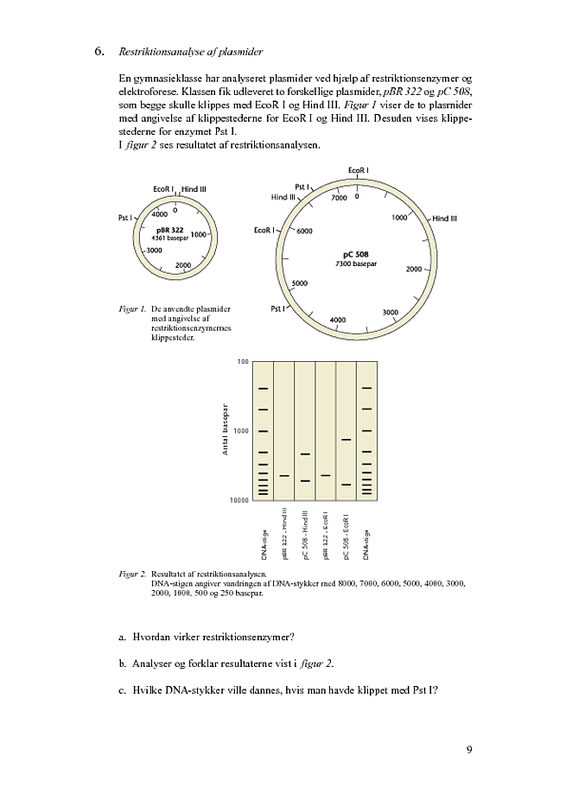 How to isolate two plasmids from E. Coli strand? What are the possible reasons to get extra unrecognized band in agarose gel electrophoresis?